So now Arte Moreno doesn’t want to pay? After Albert Pujols and Josh Hamilton, C.J. Wilson and Vernon Wells, Torii Hunter and Gary Matthews Jr.? Hey, it’s Moreno’s money. He can spend it any way he likes. The guy must be a phenomenal businessman, able to convince Fox Sports that 20 seasons of Angels telecasts are somehow worth $3 billion. Moreno’s team has had a payroll in excess of $120 million in the past four seasons. It is strange, though, to read that the owner now wants to avoid paying luxury tax just one year after he signed off on paying Joe Blanton $15 million. The Angels have only about $10 million worth of payroll space left, according to reports, and they remain two pitchers short of a rotation. The Angels just gave Joe Smith $15.75 million to take care of the eighth innings for the next three seasons, making it obvious that $10 million isn’t going to go very far in filling out the starting five. So GM Jerry Dipoto is searching for a trade partner interested in Howie Kendrick, Erick Aybar or Mark Trumbo, who should be embraced as one of the best bargains in baseball but instead might have to go because the Angels absolutely had to have Hamilton last off season. “Hamilton’s move cements L.A. as game’s power center,” read a headline on Sports Illustrated’s website. 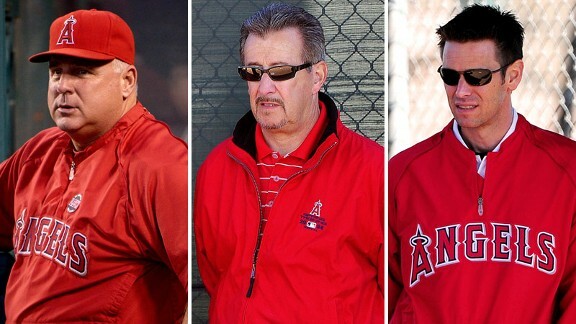 The Angels then spent 161 games of their 162-game season at or below .500. MLB negotiators’ latest proposal for the posting system would establish a maximum bid and include a provision prioritising teams with low records, Sponichi reports (Japanese link). Under the plan, multiple teams could submit the maximum bid for a player, with negotiating rights going to the club that had the lowest winning percentage that year. Nippon Professional Baseball was scheduled to discuss the proposal in a meeting with the 12 NPB teams on Tuesday. Last month, the two sides nearly reached an agreement that would have seen the Japanese team paid a posting fee equal to the midpoint between the top two bids. However, this arrangement was ultimately rejected by MLB because of opposition by small-market teams, which insisted that the posting fee be counted against the luxury tax. As the article notes, this new proposal and its maximum bid could encourage greater participation among small-market teams. A marquee name like Masahiro Tanaka is all but off-limits for low-revenue clubs under the current system, which can require teams to pay more than $50MM just to get to the negotiating table. Small-market owners are therefore likely to drop their luxury tax-related demands if a scheme that gives priority to lower-ranking teams is on offer, Sponichi reports. However, winning teams are certain to oppose the plan because it would greatly reduce their chances of securing negotiating rights. It’s also unclear how the proposal would be received by the 12 Japanese teams, which would appear to gain little by agreeing to a system with a maximum bid. Pretty sad to see the negotiations over the new posting system between NPB and MLB continue to drag on. It’s already December now, and MLB teams are trying to set their rotations for next season. It doesn’t look too good when NPB sends its director of baseball operations (Nobuhisa Ito) to negotiate with a monolith like MLB, then he comes back and blames the other side for a deal not being reached. Being embarrassed on the international stage is definitely not cool, but is it just me, or are the NPB folks completely oblivious? Just a shrug of the shoulders like we so often see in this country. NPB really needs to get its house in order. First there was the ball scandal, now no commissioner or new posting system.